Memories of the occupation during Soviet times are still fresh in Lithuania, Estonia and Latvia. RUKLA, Lithuania — The U.S. military and its NATO allies have sliced the number of days needed to deploy armored vehicles to a former Cold War foe almost in half in just a year amid concern about potential Russian aggression in Europe. NATO countries are still seeking more support in the wake of Russia's 2014 military intervention and annexation of Crimea from Ukraine. Poland, the former Warsaw Pact member that joined NATO in 1999, reportedly offered the U.S. around $2 billion recently to establish a permanent military base in the country. Sweden has 65,000 bunkers. A 'wake-up call' from Russia means its building more. Saber Strike, a U.S.-led military exercise featuring about 18,000 soldiers, is conducted annually in Poland and the Baltics. The war games, which finished last week, has become a major part of NATO’s deterrence measures against Russia and offers a chance for troops to focus on speed. Capt. William Rand of the U.S. Army's 2nd Cavalry Regiment said his unit had substantially boosted its pace of deployment during this year's drills. The road march of armored personnel carriers from Germany to Poland took about five days, compared to nine in 2017. 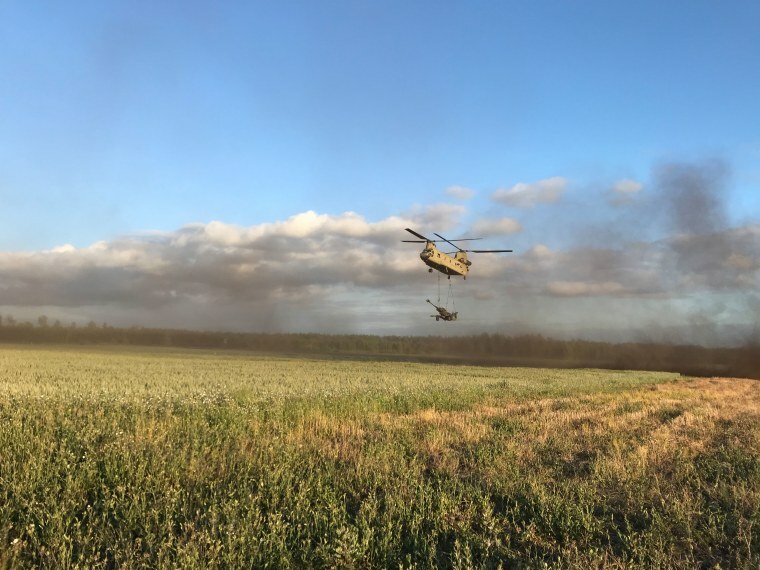 As part of Saber Strike, the 2nd Cavalry Regiment's mission was to help secure an abandoned airfield at the Panevsžys military base in central Lithuania. In March, Russian President Vladimir Putin denied that a new Cold War was underway but said "listen to us now” when he unveiled new weapons — including nuclear missile technology. The Trump administration's 2017 National Security Strategy said "Russia's invasions of Georgia and Ukraine ... demonstrated its willingness to violate the sovereignty of states in the region." It added, "Russia continues to intimidate its neighbors with threatening behavior, such as nuclear posturing and the forward deployment of offensive capabilities." Maj. Gen. Vitalijus Vaikšnoras, chief of the Joint Staff of the Lithuanian armed forces, told NBC News that increased cooperation had improved the reaction time of NATO allies in recent years. Vaikšnoras watched German and British amphibious vehicles ferry heavy American armored Stryker vehicles across the Neman River. “It’s a very strong message that not only Lithuania and Lithuanian armed forces, but as well as our allies are going, if necessary, to come here and defend Lithuania, the Baltic region and the eastern frontier of NATO against any aggressor,” he added. But experts say speedier deployments by the alliance might not be enough in case of a conflict along NATO's eastern front. Military analysts believe Russia’s military would likely still have an advantage. Gustav Gressel, a senior policy fellow with the European Council on Foreign Relations, said Russia has concentrated on speed and built a smaller but more mobile army than during the Soviet era. Following NATO's 2016 summit, the alliance stationed about 1,000 soldiers each in Estonia, Latvia, Lithuania and Poland. "Things have improved certainly. NATO has taken important steps with the enhanced forward presence initiative,” said David Shlapak, a senior defense researcher at the RAND corporation. “There remains an open question wether the forces present in the region would be adequate if deterrence fails and a conflict would occur." For now, NATO has been focusing on the rapid reinforcement of troops. During Saber Strike, a U.S. Air Force C-17 transport plane delivered Kentucky National Guard heavy artillery from Poland to a military airfield in Rukla, Lithunaia. The site has rarely been used by large aircraft since the Soviets abandoned it and pulled out of Lithuania after the end of the Cold War. Later that day, three U.S. Army Chinooks delivered howitzer artillery guns and soldiers to operate them to nearby agricultural fields. “Mobility inside Europe is important to us," Brig. Gen. Richard Coffman of the U.S. Army’s 1st Infantry Division said. "We plan accordingly so that we can be ready for any crisis that is presented to us."